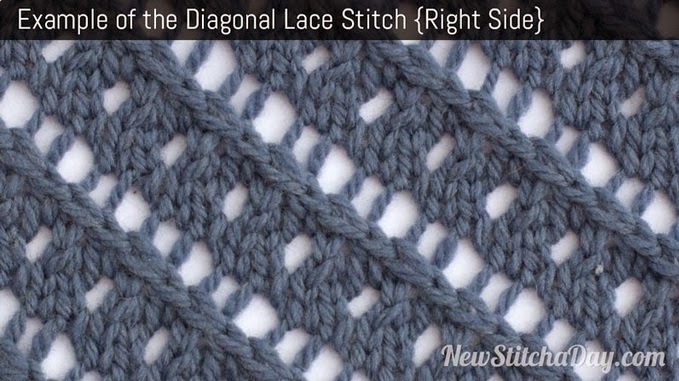 You’ll need multiple of 11 + 2 edge stitches. Work the right side following the diagram. Purl the first row and all the stitches on the wrong side. The first row is on the wrong side. 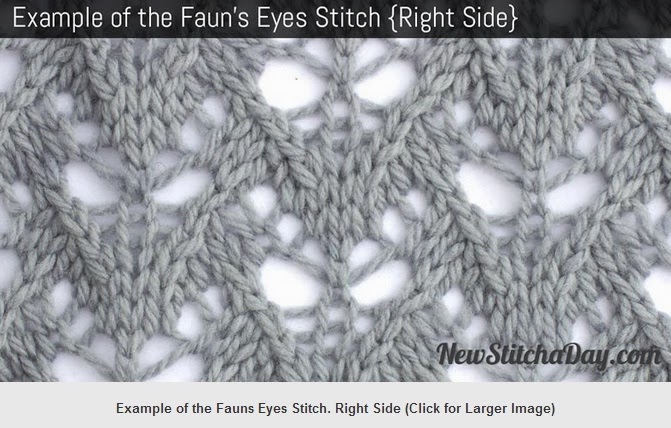 Repeat the pattern between the arrows until desired width is reached. Cast On anel of 8 sts on a background of reverse St st.
Row 1(Right Side): Knit 8. 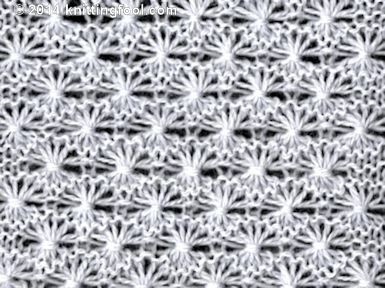 Cast On: Multiple of 15 sts + 1. (Right Side): *k1, yo, k1, ssk, p1, k2tog, k1, yo, p1, ssk, p1, k2tog, yo, k1, yo; rep from *, end k1. p1, *p4, k1, p1, k1, p3, k1, p4; rep from *. *k1, yo, k1, ssk, p1, k2tog, k1, p1, sl 1, k2tog, psso, yo, k3, yo; rep from *, end k1. p1, *p6, k1, p2, k1, p4; rep from *. *(k1, yo) twice, ssk, p1, (k2tog) twice, yo, k5, yo;rep from *, end k1. p1, *p7, k1, p1, k1, p5; rep from *. *k1, yo, k3, yo, sl 1, k2tog, psso, p1, yo, k1, ssk, p1, k2tog, k1, yo; rep from *, end k1. p1, *(p3, k1) twice, p7; rep from *. *k1, yo, k5, yo, ssk, k1, ssk, p1, k2tog, k1, yo; rep from *, end k1. p1, *p3, k1, p2, k1, p8; rep from *. Repeat rows 1-10 until you reach your desired length. Cast On: Multiple of 4 sts + 1.
k1, *yo, ssk, k1, k2tog, yo, k1; rep from *. k1, *yo, k1, sl 1, k2tog, psso, k1, yo, k1; rep from *. k1, *k2tog, yo, k1, yo, ssk, k1; rep from *. k2tog, *(k1, yo) twice, k1, sl 1, k2tog, psso; rep from * to last 5 sts, end (k1, yo) twice, k1, ssk. 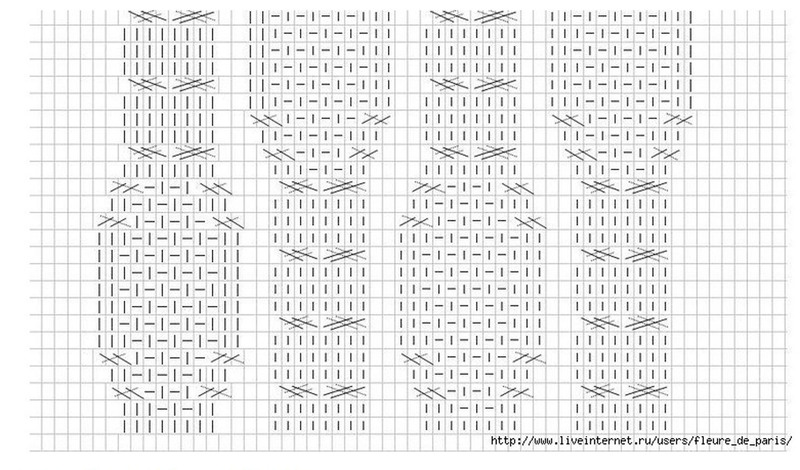 Repeat rows 1-8 until . 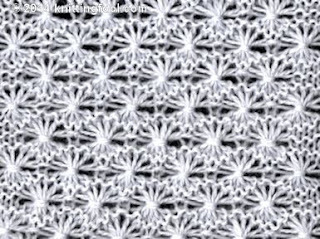 Cast On:Worked over 24 sts on a background of St st.
(Right Side): sl 1, k2tog, psso, k7, yo, k1, yfrn, p2, yon, k1, yo, k7, k3tog. sl 1, k2tog, psso, k6, [yo, k1] twice, p2, [k1, yo] twice, k6, k3tog. sl 1, k2tog, psso, k5, yo, k1, yo, k2, p2, k2, yo, k1, yo, k5, k3tog. sl 1, k2tog, psso, k4, yo, k1, yo, k3, p2, k3, yo, k1, yo, k4, k3tog. sl 1, k2tog, psso, k3, yo, k1, yo, k4, p2, k4, yo, k1, yo, k3, k3tog. Cast On anel of 16 sts. (Wrong Side): K1, p14, k1. P1, k3, k2tog, yo, k4, yo, ssk, k3, p1. P1, k2, k2tog, yo, k6, yo, ssk, k2, p1. P1, k1, k2tog, yo, k2, p4, k2, yo, ssk, k1, p1. K1, p5, k4, p5,, k1. P1, k2tog, yo, k3, p4, k3, yo, ssk, p1. P2tog, yon, k1, yfrn, *p3tog, yon, k1, yfrn; rep from * to last 2sts, p2tog. (wrong side) k1, *p2tog, yo, p 11, k1; rep from * to end. k1, *ssk, yo, C6B; k6; rep from * to end. 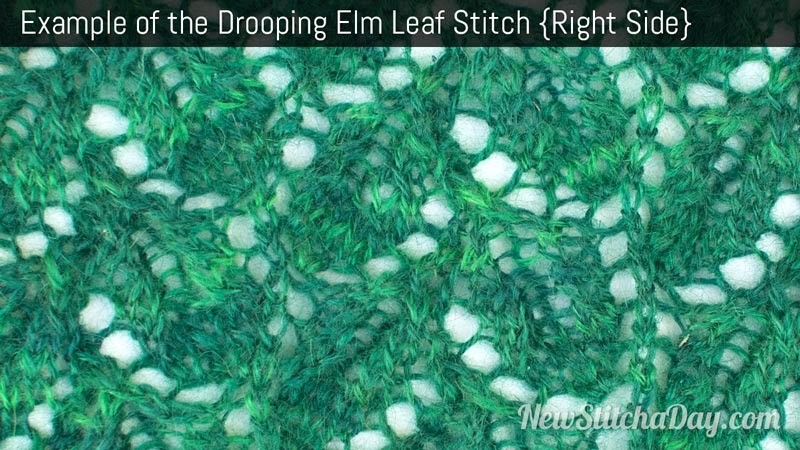 If you don’t have a cable needle handy, use a DPN instead. k1, *ssk, yo, k12; rep from * to end. k1, *p2tog, yo, p 11, k1; rep from * to end. k1, *ssk, yo, k3, C6F; k3; rep from * to end. 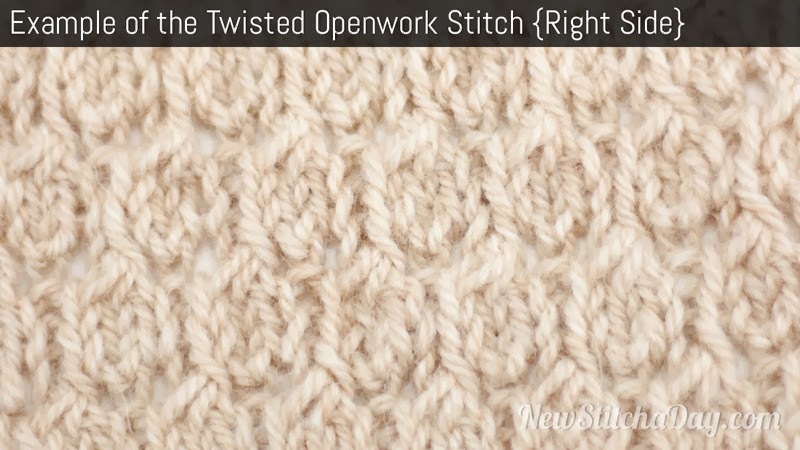 Slip Slip Knit (ssk)- Work to the place where the decrease is to be made. 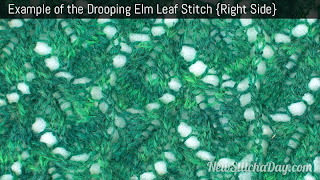 Slip the next 2 stitches, one at a time as if to knit, to the right needle. 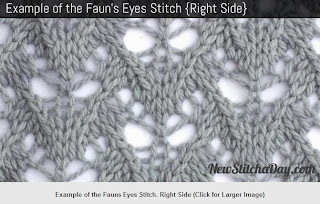 Insert the left needle into the fronts of these two stitches and knit them together. 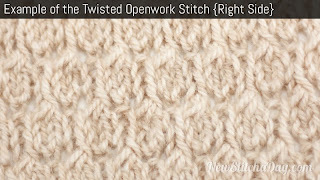 One stitch is decreased. This decrease slants to the left. Cast On: Multiple of 12 sts + 1. Cast On: Multiple of 8 sts + 4. Row 1 (Right Side): k2, *yo, sl 1, k1, psso, k1, k2tog, yo, k3, rep from * to last 2 sts, k2. Row 2: p7, *p2tog tbl, yo, p6; rep from * to last 5 sts, p2tog tbl, yo, p3. Row 3: k4, *yo, sl 1, k1, psso, k1, k2tog, yo, k3; rep from * to end. Row 4: p5, *p2tog tbl, yo, p6; rep from * to last 7 sts, p2tog tbl, yo, p5. Row 5: k1, *k2tog, yo, k3, yo, sl 1, k1, psso, k1; rep from * to last 3 sts, k2tog, yo, k1. Row 6: p3, *p2tog tbl, yo, p6; rep from * to last st, p1. Row 7: k3, *k2tog, yo, k3, yo, sl 1, k1, psso, k1; rep from * to last st, k1. Row 8: p1, *p2tog tbl, yo, p6; rep from * to last 3 sts ,p2tog tbl, yo, p1. 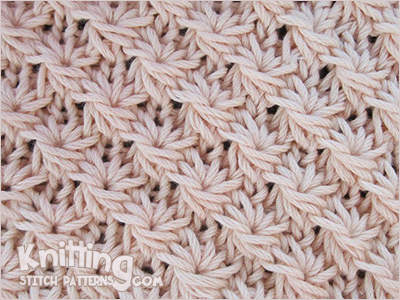 Repeat rows 1-8 until you have reached your desired length. Knitted in a multiple of 8 sts and 16-row repeat. Row 1 - right side: * K1, p1, k1, p5; rep from * to end. 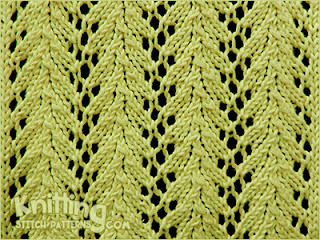 Row 2 and all wrong side rows: Knit the knit sts and purl the purl sts as they face you. Row 3; K1, p1, * k5, p1, k1, p1; rep from * to last 6 sts, k5, p1. Row 5: K1, * p5, k1, p1, k1; rep from * to last 7 sts, p5, k1, p1. Row 7: * K5, p1, k1, p1; rep from * to end. Row 9: P4, * k1, p1, k1, p5; rep from * to last 4 sts, (k1, p1) twice. Row 11: K3, * p1, k1, p1, k5; rep from * to last 5 sts, p1, k1, p1, k2. Row 13: P2, * k1, p1, k1, p5; rep from * to last 6 sts, k1, p1, k1, p3. Row 15: K1, * p1, k1, p1, k5; rep from * to last 7 sts, p1, k1, p1, k4. 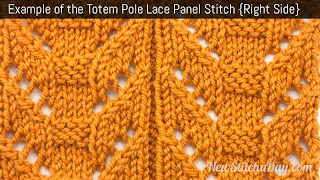 Row 16: Knit the knit sts and purl the purl sts as they face you. 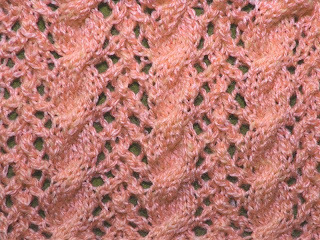 Knitted in a multiple of 18 sts + 10 and 18-row repeat. Row 1- right side: * K11, p2, k2, p2, k1; rep from * to last 10 sts, k10. Row 2: P1, k8, p1, * p1, (k2, p2) twice, k8, p1; rep from * to end. Row 3: * K1, p8, (k2, p2) twice, k1; rep from * to last 10 sts, k1, p8, k1. Row 4: P10, * p1, k2, p2, k2, p11; rep from * to end. Rows 5 to 8: Rep rows 1 to 4. Row 10: (P2, k2) twice, p2, * p10, (k2, p2) twice; rep from * to end. Row 11: * (K2, p2) twice, k2, p8; rep from * to last 10 sts, (k2, p2) twice, k2. Row 12: (P2, k2) twice, p2, * k8, (p2, k2) twice, p2; rep from * to end. Row 13: * (K2, p2) twice, k10; rep from * to last 10 sts, (k2, p2) twice, k2. Rows 14 to 17: Rep rows 10 to 13. Cast on: multiple of 6 sts + 1. 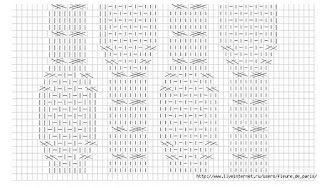 Row 2: K3tog, * yo, (k1, yo, k1) in next stitch, yo, k5tog; repeat from * to last 4sts, yo, (k1, yo, k1) in next stitch, yo, k3tog-tbl. Row 3: K1, * p5, k1; repeat from * to end. Row 4: P1, * k5, p1; repeat from * to end. Row 5: K1, * p5, k1; repeat from * to end. K5tog: K2tog tbl, k3 tog, pass the k2tog tbl stitch over the k3tog stitch. 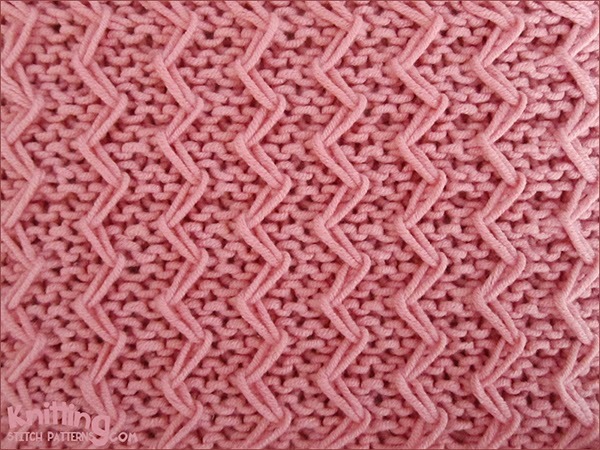 Knitted in a multiple 4 sts, and 4-row repeat. 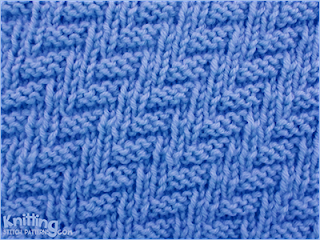 Row 1 (Right side): Purl all sts. Row 2: * (Knit 1, purl 1, knit 1) all in the same st, purl 3 sts together; repeat from * to end. 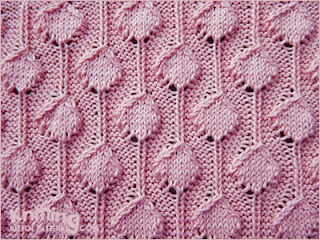 Row 3: Purl all sts. 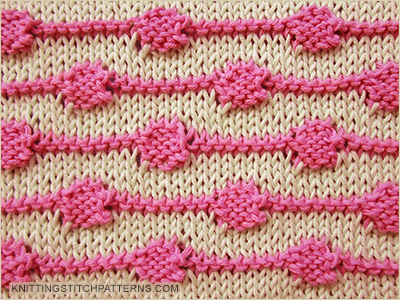 Row 4: * Purl 3 sts together, (knit 1, purl 1, knit 1) all in the same st; repeat from * to end. Knitted in a multiple of 12 sts and a 12-row repeat. 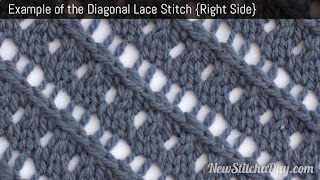 Row 1 – wrong side: With color A, purl. 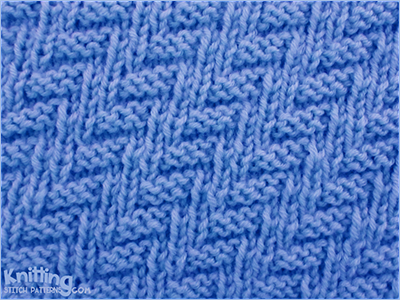 Row 2 – right side: With color A, knit. Row 4: With color B, k11, * turn, sl 1 wyif, k3, turn, p4, k12; rep from * to last st, turn, sl 1 wyif, k3, turn, p4, k1. Row 5: With color B, k5, * turn, p4, turn, k3, sl 1 wyif, k12; rep from * to last 7 sts, turn, p4, turn, k3, sl1 wyif, k7. Row 6: With color A, k8, * sl 2 wyib, k10; rep from * to last 4 sts, sl 2 wyib, k2. Row 7: With color A, purl. 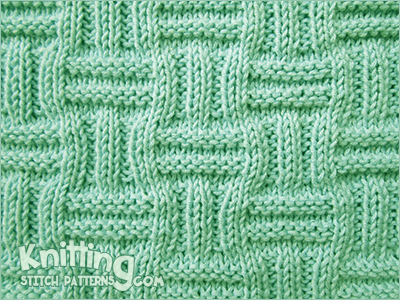 Row 8: With color A, knit. Row 9: With color A, purl..
Row 10: With color B, k5, * turn, sl 1 wyif, k3, turn, p4, k12; rep from * to last 7sts, turn, sl 1 wyif, k3, turn, p4, k7. Row 11: With color B, k11, * turn, p4, turn, k3, sl 1 wyif, k12; rep from * to last st, turn, p4, turn, k3, sl 1 wyif, k1. Row 12: With color A, k2, * sl 2 wyib, k10; rep from * to last 10 sts, sl 2 wyib, k8. 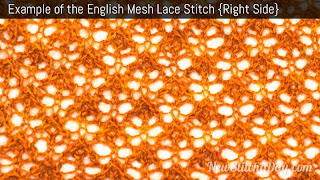 Daisy stitch: Slip knitwise next 5 sts to RH needle dropping extra wraps, slip them back to LH needle, (knit 1, yarn over, knit 1, yarn over, knit 1) into all 5 stitches together through the back loop. 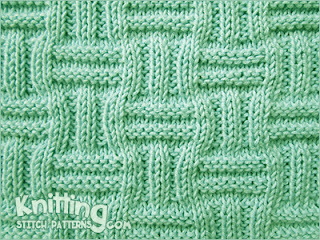 Cast on a multiple of 6 sts + 1 and knit one row. Row 1 - Wrong side: P1, * (purl the next stitch wrapping the yarn twice around the needle) 5 times, p1; rep from * to end. 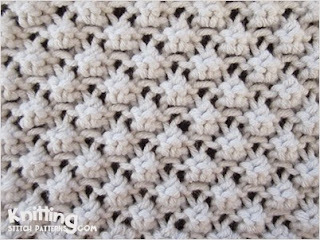 Row 2 - Right side: K1, * Daisy stitch, k1; repeat from * end . 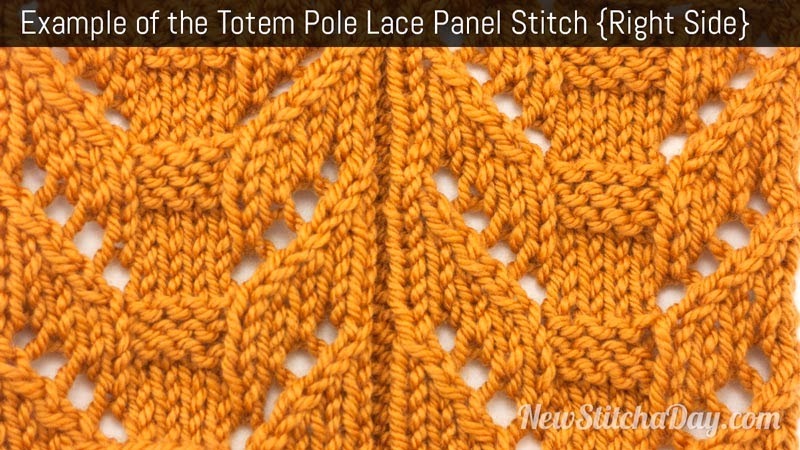 Row 3: P4, * (purl the next stitch wrapping the yarn twice around the needle) 5 times, p1; repeat from * to last 3 sts, p3. 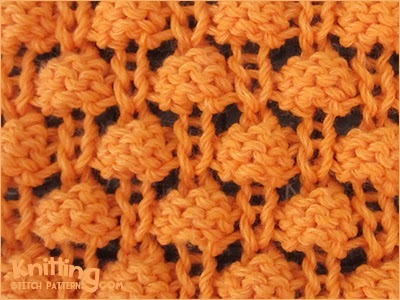 Row 4: K4, * Daisy stitch, k1; repeat from * to last 3 sts, k3. 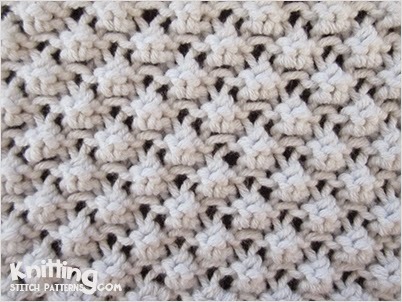 Repeat rows 1-4. until you have reached your desired length. 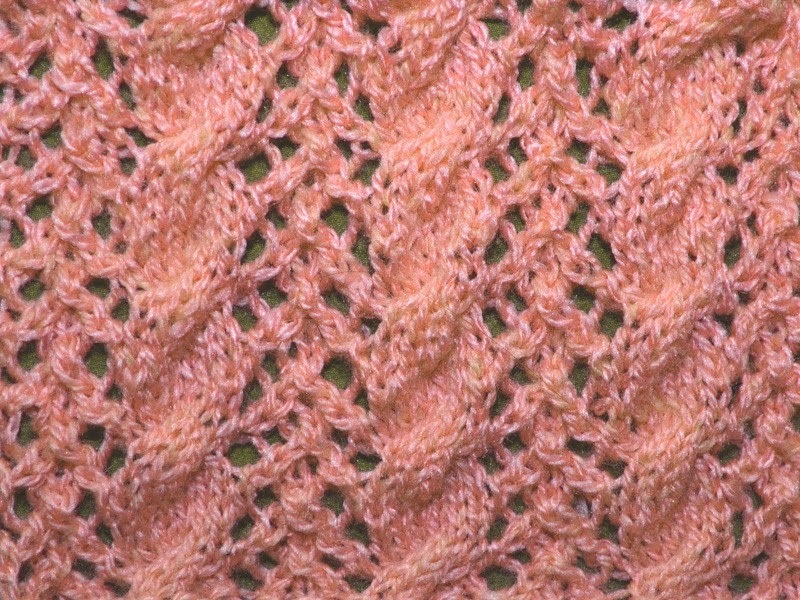 Knitted in a multiple of 10, + 4 sts and 20-row repeat. Row 1 - right side: P4, * k1, p4, yo, k1, yo, p4; repeat from * to end. Row 2: K4, * yo, p3, yo, k4, p1, k4; repeat from * to end. Row 3: P4, * k1, p4, yo, k5, yo, p4; repeat from * to end. Row 4: K4, * yo, p7, yo, k4, p1, k4; repeat from * to end. Row 5: P4, * k1, p4, yo, k9, yo, p4; repeat from * to end. Row 6: K4, * p2 tog, p7, p2 tog-b, k4, p1, k4; repeat from * to end. Row 7: P4, * k1, p4, ssk, k5, k2 tog, p4; repeat from * to end. Row 8: K4, * p2 tog, p3, p2 tog-b, k4, p1, k4; repeat from * to end. Row 9: P4, * k1, p4, ssk, k1, k2 tog, p4; repeat from * to end. Row 10: K4, * p3 tog, k4, p1, k4; repeat from * to end. Row 11: P4, * yo, k1, yo, p4, k1, p4; repeat from * to end. Row 12: K4, * p1, k4, yo, p3, yo, k4; repeat from * to end. Row 13: P4, * yo, k5, yo, p4, k1, p4; repeat from * to end. Row 14: K4, * p1, k4, yo, p7, yo, k4; repeat from * to end. Row 15: P4, * yo, k9, yo, p4, k1, p4; repeat from * to end. Row 16: K4, * p1, k4, p2 tog, p7, p2 tog-b, k4; repeat from * to end. Row 17: P4, * ssk, k5, k2 tog, p4, k1, p4; repeat from * to end. Row 18: K4, * p1, k4, p2 tog, p3, p2 tog-b, k4; repeat from * to end. Row 19: P4, * ssk, k1, k2 tog, p4, k1, p4; repeat from * to end. Row 20: K4, * p1, k4, p3 tog, k4; repeat from * to end. P2tog: Purl 2 sts together | P2tog-b: Purl 2 sts through back loop | P3tog: Purl 3 sts together. 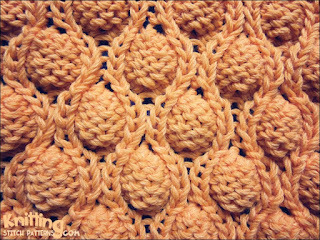 Knitted in a multiple of 8 sts +1 and 12-row repeat. Row 9: P1, *p5tog, p1, m1 , (k1, p1, k1) in next st, m1 , p1; rep from * to end. 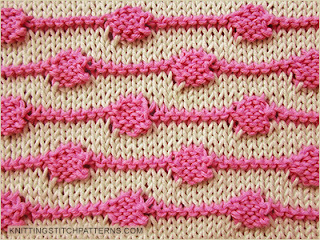 Make one: M1 - knit 1 under running thread between the st just worked and the next st.
Purl 5 sts together: P5tog - slip 2 sts as if to knit, purl 3 sts together, pass 2 slipped stiches over. Row 2 and all alternative rows: k2, *p6, k2*. Row 3: *p2, k3, k2tog, k1, yo*, p2. Row 5: *p2, yo, ssk, k4*, p2. Row 7:*p2, yo, k1, ssk, k3*, p2. Row 8: k2, *p6, k2*. 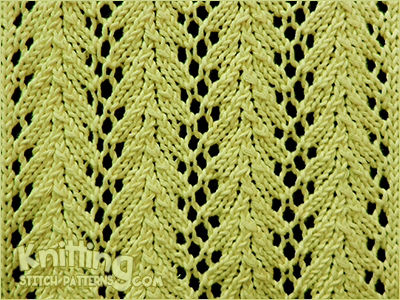 8 rows make up the lace rib stitch knitting pattern. Repeat the pattern between the asterisk's *. Multiple of 16 + 1. 1st row (right side): [K2, p2] twice, k1, p2, k2, p2, *k3, p2, k2, p2, k1, p2, k2, p2 rep from * to last 2 sts, k2. 3rd row: K1, *p1, k2, p2, k5, p2, k2, p1, k1; rep from * to end. Panel of 30 sts on a background of reverse St st*. 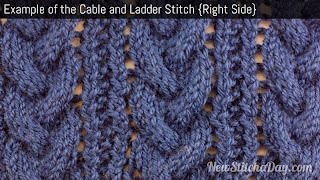 C6B = Slip next 3 sts onto cable needle and hold at back of work, knit next 3 sts from left-hand needle, then knit sts from cable needle. 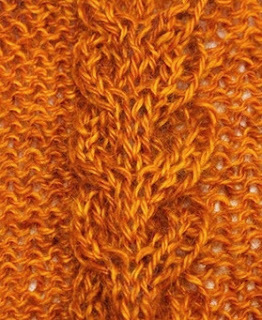 C6F = Slip next 3 sts onto cable needle and hold at front of work, knit next 3 sts from left-hand needle, then knit sts from cable needle. 7th row: C6B, k18, C6F. 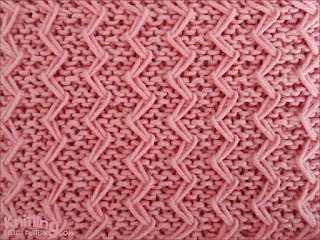 *To work a background of reverse stockinette stitch, in straight stitching, purl the first row, knit the second and repeat these two rows. 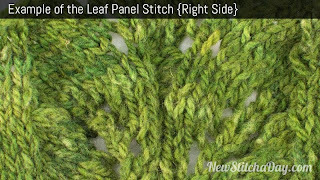 - With yarn in back, slip the next 5 sts to a cable needle purlwise dropping the extra wraps. 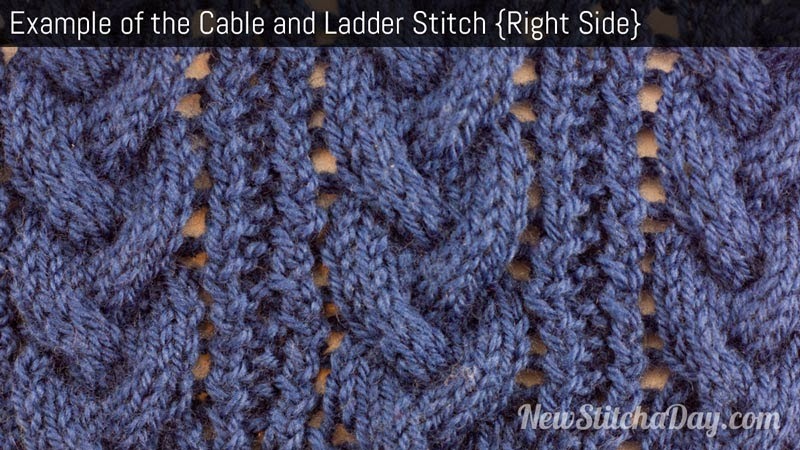 - Wrap the yarn around the 5 sts on the cable needle twice. 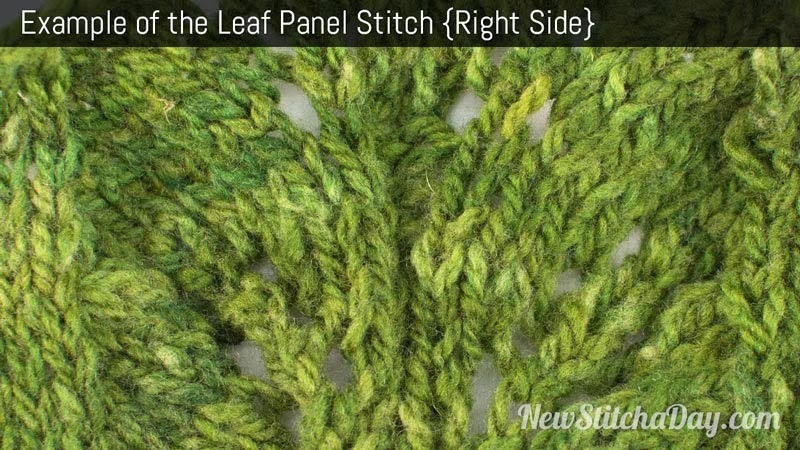 - Then slip the 5 sts to the right-hand needle. 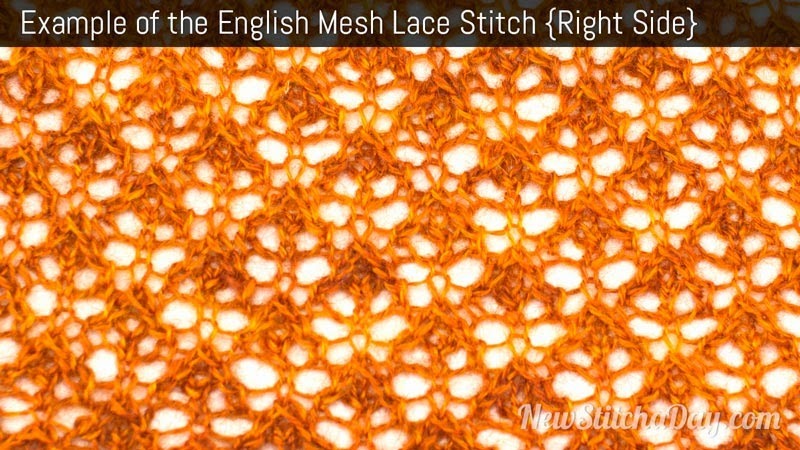 Watch the video to learn how to knit the flower stitch. Cast on multiple of 6 sts, + 1. 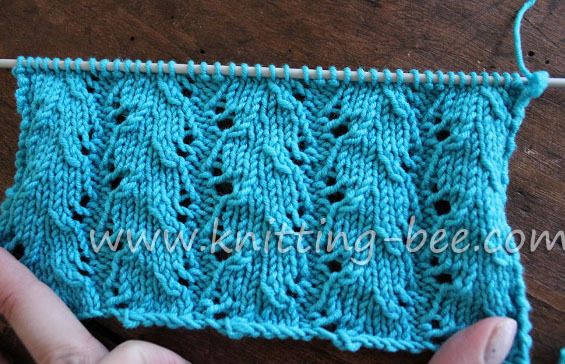 Row 2: Knit 1, * (knit the next stitch wrapping the yarn 3 times around the needle) 5 times, knit 1; rep from * to end. 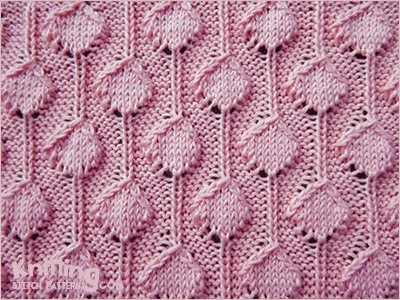 Row 3: Purl 1, * flower stitch; purl 1; rep from * to end. Новый шикарный узор спицами "Спираль"